St Bartholomew’s Hospital is the only mediaeval hospital in London which still stands on its original site. It was founded in 1123 by Rahere, who had been a minstrel in the royal court of Henry I. Rahere, although of humble origins, was able to befriend both kings and courtiers. In 1123, when approximately a thousand prelates flocked to Rome on the occasion of the First Ecumenical Lateran Council, Rahere was struck down by a grave illness, possibly malaria, and vowed that, should he recover, he would return to London and found a hospital for the sick poor of the City. He was looked after by the monks of the monastery on the Island of Tiber, the monastery having been founded just over a decade previously. (The reputation of the Isola Tiberina as a place where health could be regained can be traced back to ancient Rome, when it housed the Temple of Aesculapius. The remains of the stonework of the temple, shaped as the bow of a boat, are in evidence to this day.) Rahere recovered, returned to London and built a hospital and adjacent monastery on the Smithfield site. He dedicated them to St Bartholomew. During the reformation the priory of St Bartholomew was closed in 1539, but the hospital remained open. Eventually, on his death bed, Henry VIII signed the charter of 1546, granting the hospital to the City, and letting it be called The Royal Hospital of St Bartholomew. In 1609 William Harvey became Physician to the hospital. He was the first to demonstrate the circulation of the blood and these works, published in 1628, were later recognised as the foundation of modern medicine. 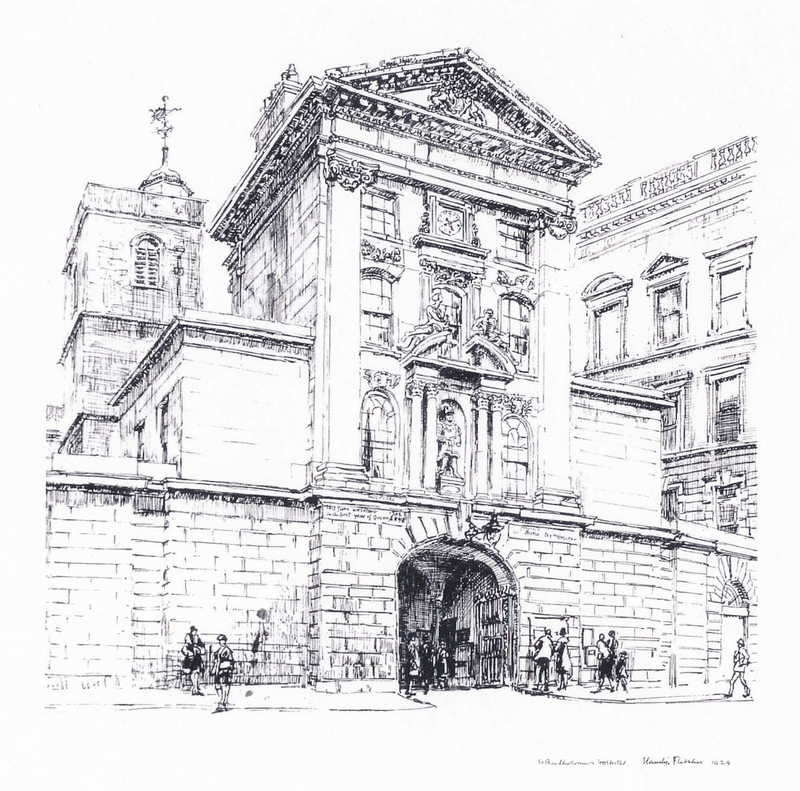 Other distinguished clinicians who practised at Barts included Percival Pott and James Paget. The hospital remained open during the Great Plague of 1665; the surgeons and physicians fled to the country leaving the Matron and the Apothecary to tend to the patients. The hospital escaped the Great Fire of London the following year. It remained open and largely survived the bombing of the Second World War. On this occasion a full complement of medical and nursing staff looked after the victims of the Blitz. The Gatehouse, designed by Christopher Wren’s nephew, was completed in 1702 and houses the statue of Henry VIII, the only one of this monarch in London. The buildings of the square and the fountain were the work of James Gibb.